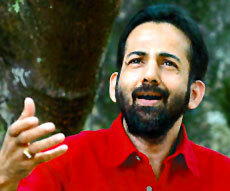 Kavalam Srikumar was born on 3rd March in the year 1959 in Alleppey in Indian state Kerala. He was born to a celebrated father Padmabhushan Sri. Kavalam Narayana Panikkar, famous Theatre Director and Poet and mother J. Saradamony. At the tender age of five years Kavalam Srikumar started receiving his training in Classical Music Vocal (South Indian Music). He has however bagged the honor of being trained under the legendary gurus like Ambalappuzha Sivasankara Panikkar, Trichur Vaidyanathan, Mavelikkara Prabhakara Varma and Ambalappuzha Thulasi. Later on he received his advanced Carnatic music training under the expert tutelage of illustrious Violinist Shri.B.Sasikumar of All India Radio, Trivandrum. By his educational Qualification he is a Master degree holder in Commerce from Kerala University. He is married to Smt. Lekshmy, and the couple has two children: S. Krishna Narayanan & Gouri Sreekumar. Kavalam Srikumar was such a talented performing artist that he has been conferred the first prize for the consecutive 5 years in Classical Vocal in the University Youth Festival. Kavalam Srikumar has performed in all most all the Music Concerts all over Kerala, in music sabha`s in Madras and some foreign countries. He has also bagged the honor of visiting Russia and Japan in connection with the festival of India. Apart from that in order to execute he has visited places like London, Paris, Singapore America and Gulf countries. In November 2004, Kavalam Srikumar as part of Surya Music Festival visited Europe and Gulf, to perform classical music concerts. Kavalam Srikumar possesses a unique style of delivering classical music. Thus his voice can be attributed as the voice that is enriched with tremendous voice culture, expression and clarity of lyrics. His execution has been characterized as `soulful, clear, authentic and powerful`. He has enriched the depiction of Ramayana, Bhagavatha, Lalitha & Vishnu Sahasra Namam, Soundarya Lahari, Dhyana Slokas etc through his execution. These all have fetched rave reviews and acclamation through out the world. His performance of Adhyatma Ramayana for one month during July – August is telecast every year in popular Malyalam T.V. channels like Asianet and Amritha. Kavalam Srikumar has also lend his voice for Malayalam films like Agnisakshi, Ashtapadi, Thambu, Ilakkangal, Aalolam, Kanalaattam, Panchajanyam, Madhuchandralekha, Suryan etc. Acknowledging his talent he has been conferred many accolades like Akashvani (All India Radio) Annual Award for the best musical feature produced in the year 1989 & 1990 (“Gurussakshath Param Brahma” on Adi Sankaracharya and “Parayipetta Panthirukulam” – national Integration Feature); Honored by Malliyur Thirumeni, a doyen in the field of Bhagavatha Sapthaham in Kerala and received a title by name “Ramakadha Shukan” from him in the year 1998; He has anchored for 4 years a very popular music programme entitled “Ragolsavam”, based on classical ragas, in the Kairali Channel T.V. Kavalam Srikumar needs no introduction. He is reputed for his rendering of the Ramayana, in addition to folk music, bhajans and Sopana Sangeetham. Son of eminent theatre personality Kavalam Narayana Panikar, Srikumar has been working with All India Radio since 1985. Here is Srikumar in his own words. What is being churned out today in the name of folk music is nothing but a pale shadow of the original. So the original forms are in real danger of being lost forever. All original works were folk-based. Take the raga Anandabhairavi, Arabhi, or Neelambhari for that matter. Some of these can be discerned in our pulluvan pattu. To teach folk music to future generations, we have to base it on ragas and structure it to know the roots, as was done in the case of Carnatic music. As is the case with Punjabi folk songs, we can include some elements of modernity too. All this requires a lot of money. That will come only if gifted and popular singers take interest in this field. Sopana Sangeetham has always been there in the family. I used to listen to masters like Njaralethu Rama Poduval and Guruvayur Janardanan, their astapathis, thianis and so on. Indeed, I was fortunate to sing with Njaralethu. I started studying Carnatic music at the age of six. My gurus included Ambalapuzha Sivasankara Panickar (disciple of the famous Ambalapuzha brothers ) and Thrissur R. Vaidyanatha Bhagavathar. Later, in Thiruvananthapuram, I began to study under B. Sasikumar, violinist (AIR). Even after 20 years , I am still his student. `Practice makes a man perfect.’ This is Sasikumar sir’s belief. Sometimes the class starts in the evening and goes on late into the night. The rendering of Adhyatma Ramayana during the Malayalam month of Karkidakam gives me a lot of pleasure. It is not mere recitation; the right emotion like sorrow, anger or joy has to be conveyed. I also enjoyed recording Vishnusahasranamam, Soundaryalahari, Mookambikasahasranamam and Lalithasahasranamam. Outside Kerala , I have given recitals of Sopana Sangeetham in Bhopal under the auspices of the Kendra Sangeet Natak Akademi. In 2001, at the invitation of the French Government, I participated in the Latitude Festival in Paris. It was sort of an informal gathering and the audience comprised people who enjoyed music. So, instead of remaining unresponsive as it often happens here, they respond to the pieces that we present. That gives us a lot of inspiration. Then, in 2004, as part of the Soorya India Festival, I performed with music director M. Jayachandran in London, Italy, Germany, Switzerland, Bahrain, Muscat, Qatar, Kuwait and Dubai. Dr. Balamuralikrishna, Pandit Jasraj and Pandit Bhimsen Joshi are some of the great singers now. Musicians like Balamuralikrishna are great composers too. Hindustani singers practise rigorously. `Shruti shudham’ – that’s what they aim at. They study and practise one raga for 10 to 15 years. Hariharan practises 10 hours a day, Parveen Sultana, for nearly 20 hours. Sadhana releases positive energy.